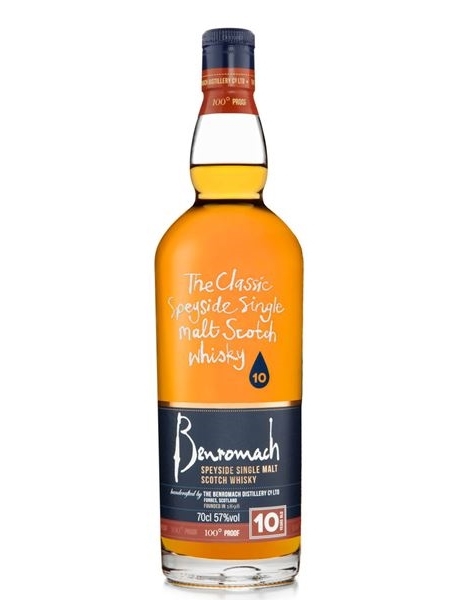 Benromach distillery was founded in the late 19th century and started distilling in 1900. It has had many closures and changes of ownership. It's current owners are the renowned independent bottlers Gordon & McPhail, who purchased the mothballed distillery in 1993 and restarted distilling 5 years later. Their house-style of whisky is balance with a light touch of smoke from their lightly peated Highland malt. They use a combination of first-fill ex-bourbon and first-fill ex-sherry casks for the maturation of this release followed by a marriage for 18months in first-fill ex-sherry casks. This 10 year old is has been branded 100 proof and is bottled at 57% ABV.